I woke up the other day with a new idea for online training to help people build their own small sustainable homes. If five or more couples/households sign up for this training program then I could guide them through the building process for a reasonable fee over the Internet using email and Skype. It’s important that everyone in the group have similar building conditions. Desert land is low cost and popular among earthbag builders, so for the first workshop it is a prerequisite that group members have some desert land with minimal building codes. We could greatly slash the time, labor and cost if everyone is building something similar with the same materials. This way people wouldn’t have to spend a year reading thousands of pages, for instance. The goal is to empower people and expedite the process. Everyone chooses a basic little design of around 200 to 300 square feet. It can be round, hexagonal, octagonal, curved, etc. I recommend scoria filled raschel mesh tubes for speed and ease of construction. (Yeah, earth is cheaper but it’s too heavy for some people.) Add cedar posts every few feet for stability. Add door and window frames, wooden bond beam, roof frame, metal roofing for water collection, and plaster and you’d have the basic structure built in weeks instead of a year or two. Most people start out with WAY too big of a house. Keep it simple! Add on later! Here’s one sample design for illustration purposes. See this Roundhouse Studio. This studio is 18’ exterior diameter, 15’ interior diameter. Let’s make it a little bigger for this project – say 16’ interior diameter (201 sq. ft.) up to about 20’ interior diameter (315 sq. ft.) is a good size range to start with. The bathroom could be moved to an adjacent room to free up more space in the main living area. Custom design options: Everyone in this workshop group could add some features to make their starter homes more sustainable and practical: cool pantry, loft, greenhouse addition, extra bedroom, extra room for a home based business, etc. Follow my advice and they would all be near zero energy buildings if you use scoria and build small. Now here’s the best part. After a few months the main starter home would be livable and you could start building another similar structure nearby. Over the course of two years or so you could build 4-6 simple little houses and create a tiny community of like-minded friends. Start a garden, plant fruit trees, drill a good well, maybe build a communal kitchen/laundry area. The possibilities are endless. If this training concept is successful then the same training method could be used for other types of houses and materials in different climates. Q: Would everyone live in the same area and help each other? A: No, everyone would have their own land and build their own home. Some may be in Arizona, some in New Mexico, Texas, etc. We would all be working at approximately the same pace at the same time. A: You’d have to devote a good amount of time to the project in order to complete the home in a timely manner. Ideally everyone could work 8 hours/day for 5 days each week. If you can only work a few hours a week then this course is not appropriate. Q: I’m alone. Will this program work for me? A: Possibly. It depends on your strength and skill level. Ideally you could get a helper now and then for important steps such as the roof. Having a semi-skilled helper with the necessary tools for just one or two days can save lots of time and money. Q: How much would my house cost? Q: Our codes require building larger houses with lots of concrete and engineering. A: Sorry, codes will skyrocket the cost of construction and greatly limit what you can do. This training program is for folks who have few or no building codes. A: The training cost has yet to be determined. It depends on how many people sign up. Plus, I need to think through everything to better determine how much of my time is required. Q: Why build with scoria? A: For this workshop you could use gravel or scoria bags for the lower courses, and scoria or earthbags for upper courses. Kelly and I like scoria (porous lava rock) because it’s lightweight, fireproof, insect and rot resistant, and in general very fast and easy to work with. Search this blog and you’ll find lots of information on scoria. I just came across this and am very interested! I would not, however, be able to build along with the course (if it were to take place soon). I plan to build between the Christmas and New Year break as it coincides with the down season at my work. I have been reading a lot of information on the website (sorry for the bombardment of replies on the various blog posts), but I do much better with visuals. I have found the YouTube videos to be very informative and have taken pages of notes. I plan to start with the roundhouse studio with a slight modification (an external bathroom, maybe square, maybe rounded, haven’t decided the merits of either yet). I’m not sure about the scoria availability here in Ghana, though we do have a lot of lava rock (it’s red, somewhat porous, but a tad heavier than the ‘lava rock’ I have seen in the US in landscaped front lawn areas). The soil also tends to be very clay-y. I plan to harvest dirt from borrow pits where people typically get the dirt to make simple clay blocks for their mud houses. I’ve added your name to the list. So far we have two people who are seriously interested in this course. If we don’t get enough people then consider building a simple tool shed so you can experiment and practice every step at very low cost. Thanks for your generous & creative offer to host a skype class! I’m in!! Very interested in building a small earthbag shed that will help me learn the skills to build larger structures later. Thx again. I already have you on my list. You’re the only one to sign up so far… It’s been a while so I sort of doubt if we’ll get enough people. 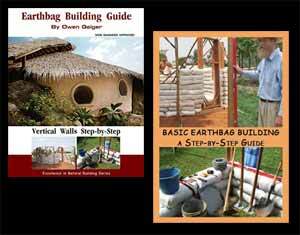 Your next best choice is to get my earthbag book and DVD that show every step. See links at top of page. Starting with a storage shed is a good idea. Hi Owen would the Spiral 2 House qualify? You want to start out with something really simple at first — one room of about 200-300 sq. ft. Or you can start with a tool shed. I told a lady yesterday to consider starting with a tool shed about 8’x12′ so there’s plenty of room for tools, and in the future you could possibly use it for other things. Once you know all the steps and have actual experience then you can building larger projects. I understand you are trying to keep to a similar plan for all. Is a container frame or steel frame an option in this build? Yes, it’s still simple enough to qualify. The cost will be higher than using local cedar (juniper) posts.